These whimsical pies are elegant and perfectly-textured -- they've got a buttery, crisp-tender crust that'll stand up to tangy-creamy curd, and the meringue holds its shape even overnight! Beat the butter in a medium bowl with an electric mixer on medium-high speed until smooth. Add the sugar and salt and continue to beat until evenly combined. Scrape down the sides of the bowl, then beat in the egg yolk. Add half of the flour, beating until just crumbly. Scrape down the bowl again; add the remaining flour and the sour cream, beating just until the dough is evenly moistened. Turn the dough out onto a lightly floured work surface and knead lightly to bring it together. Roll the dough between 2 generously floured sheets of waxed or parchment paper into a circle about 1/4-inch thick. Refrigerate for 1 hour. Cut out six 4 1/2-inch rounds using an inverted bowl or round cookie cutter. Place a round in each cup of a nonstick standard 6-cup muffin tin and use a small shot glass or your fingers to press each round into the corners and about halfway up the sides for a snug fit. Freeze the dough in the muffin tin for 15 to 30 minutes. Position a rack in the lower third of the oven and preheat to 325 degrees F. Spray the outside of 6 standard muffin liners with cooking spray and place 1 on top of each dough cup. Fill with dried beans or pie weights. Bake until the crusts are just brown around the edges, 25 to 30 minutes. Cool for about 1 minute; then carefully remove the muffin liners and baking beans. Return the muffin tin to the oven and continue baking until the crusts are cooked through and evenly browned, 15 to 20 minutes more. Cool slightly, then carefully remove the crusts from the muffin tin and cool completely on a rack. Strain through a fine-mesh strainer into a bowl. Whisk in the butter a little at a time, until smooth. Stir occasionally until cool. (Setting the bowl in a larger bowl of ice will speed this up.). Fill each tartlet with 1 1/2 tablespoons of the cool lemon filling. Bring a few inches of water to a boil in a saucepan that can hold a stand mixer's bowl above the water. Whisk together the sugar, egg whites, cream of tartar and salt in the bowl by hand. Set the bowl above the boiling water and heat, whisking, until the mixture is hot to the touch (135 degrees F) and the sugar dissolves, 1 to 2 minutes. Transfer the bowl to the mixer fitted with the whisk attachment and beat the whites at medium-high speed until they hold soft peaks. Increase the speed to high and continue to beat to make a stiff, cool meringue, about 10 minutes. Dollop or pipe on top of the filling. Just before serving, brown the merinque with a kitchen blow torch. (Alternatively, preheat the broiler to high. Set the pies on a baking sheet and place under the broiler until the meringue is evenly toasted, about 2 minutes.) Serve immediately or refrigerate until ready to serve. They can be refrigerated for up to 2 days These also freeze wonderfully! They can be assembled and frozen up to 1 week in advance. Defrost for 20 minutes before broiling the tops and serving. - The crusts can be made, baked and frozen up to 2 weeks. - The curd can be made up to 3 days in advance and refrigerated. 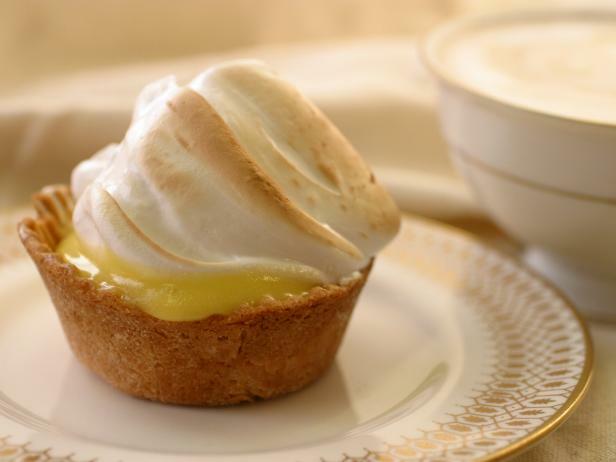 - The meringue can be made up to 1 day in advance and refrigerated.